Or if you prefer a simpler life and biscuit there are Christmas cookies made with the same dough, flavoured only with vanilla and cinammon. Also delicious. Use good-quality tea and add it to taste. I opened up a tea bag and ground some with a pestle and mortar. If you’d like to know more about masala chai you can read about the history, health benefits and spices in this black tea on my Masala chai, raspberry and pistachio layer cake post. 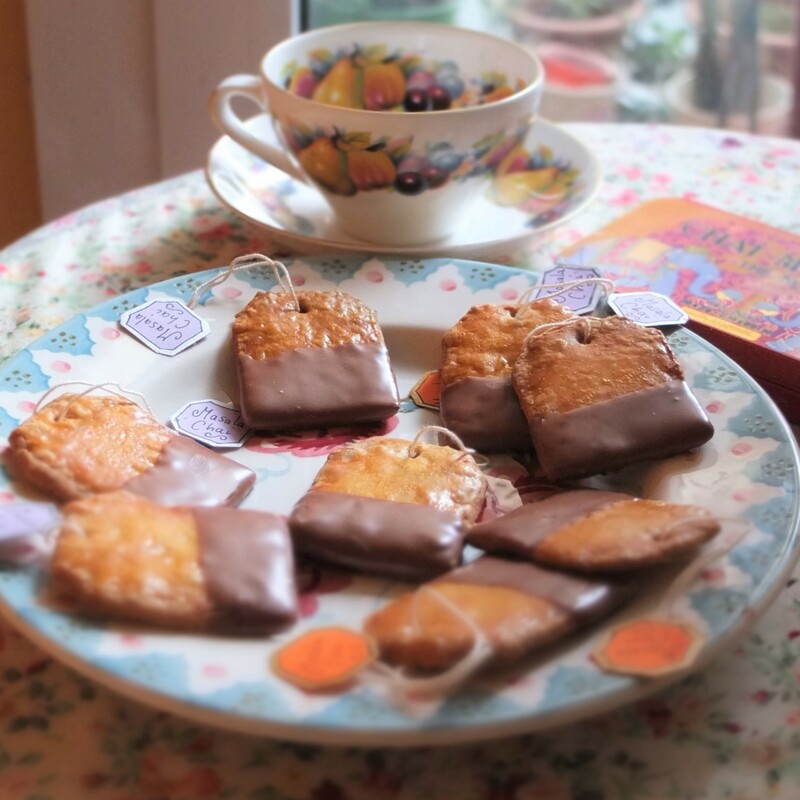 And now for the biscuits…! 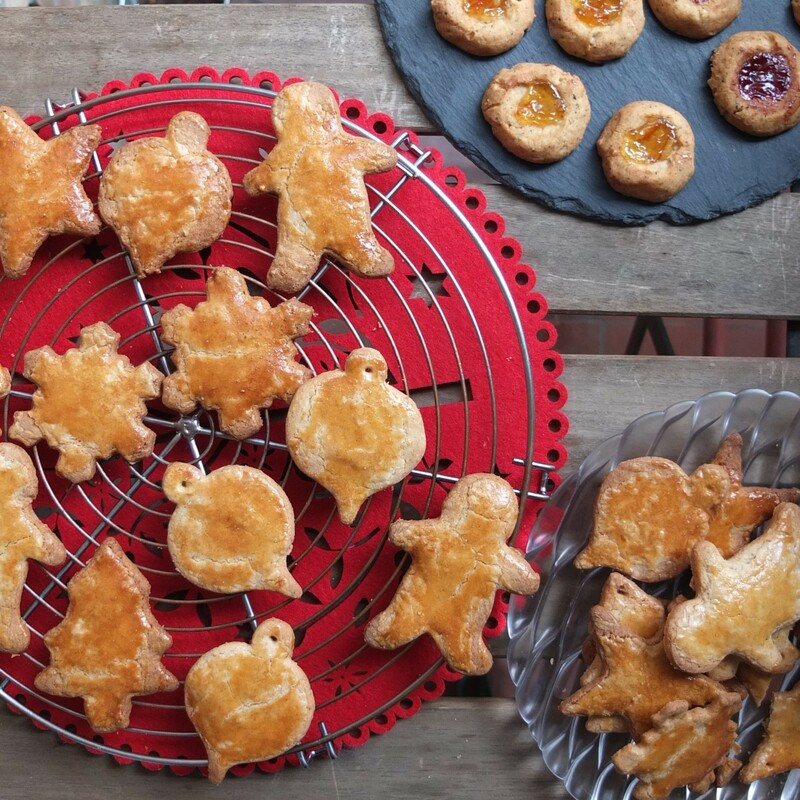 These French butter shortbreads are based on Pfeiffer’s Christmas sablés in his book The Art of French Pastry. They’re a special regional Christmas treat in Alsace, Northern France where he’s from. He explains the ground almonds contribute a nutty flavour to the dough and the butter is what makes the biscuits so flaky. They can be hung on the Christmas tree. Before baking make a hole with the end of a chopstick then once baked thread a ribbon through the hole and hang up. 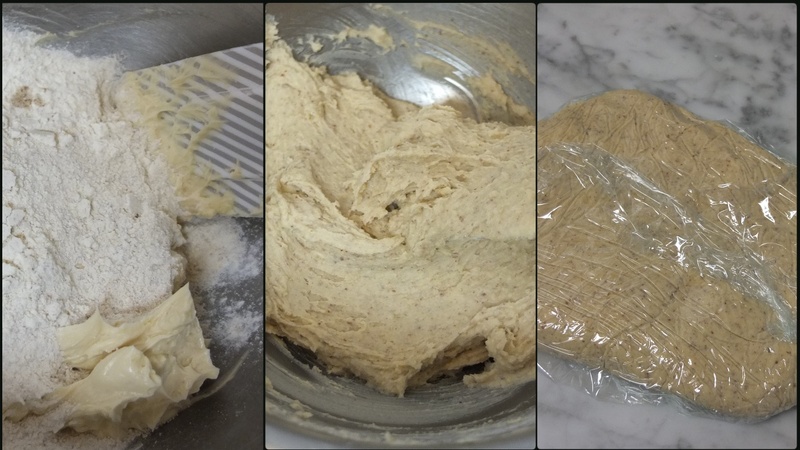 The biscuits I originally made with the full amount of butter are difficult to roll out and break quite easily so be careful or use the lower quantity of butter I suggest. 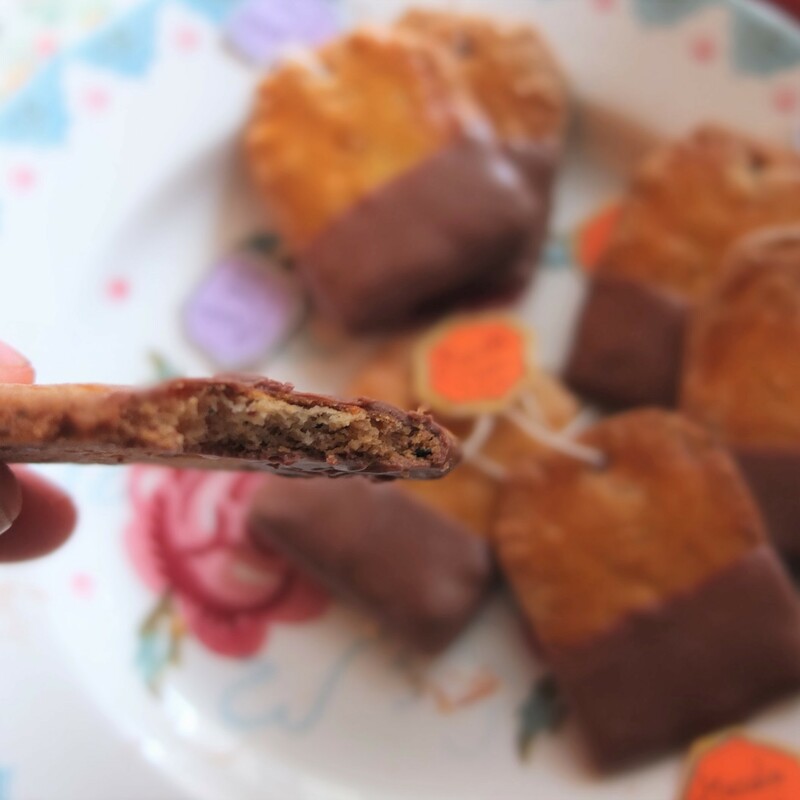 Sable is French for ‘sand’ by the way, to give you an idea of the friable crumbly nature of these yummy treats. I imagine the glutenfree flour also makes them delicate so you might find them less so with the plain all-purpose flour in the original recipe. You can also use caster (superfine) sugar to replace the maple syrup and xylitol. 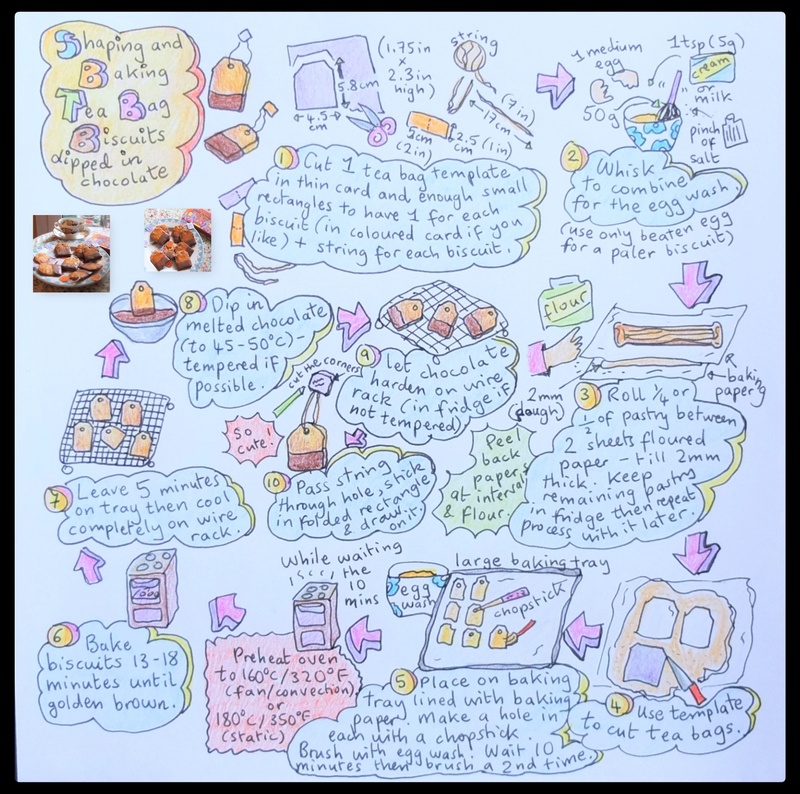 The masala chai tea bag biscuits have only 75% of the butter in the original recipe. 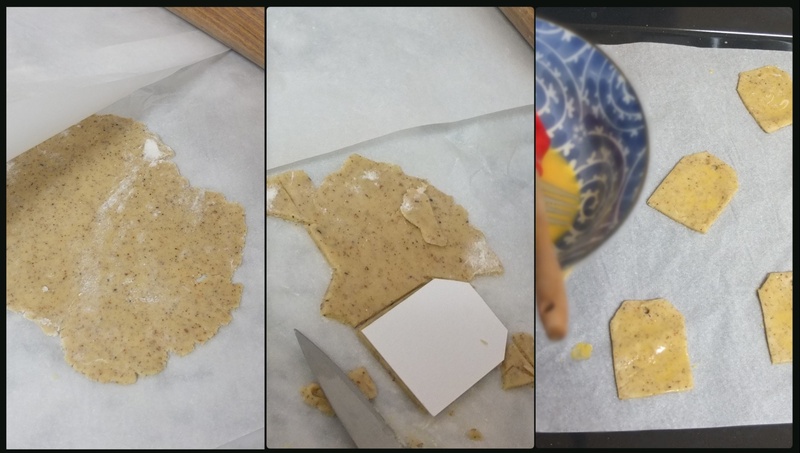 They’re still very buttery and yummy but easier to roll out, handle and less breakable. The milk chocolate adds that touch of creaminess found in chai lattes! Dark chocolate would also be delicious I’m sure. I noticed most tea bag biscuits online are paler. I’m quite attached to a golden biscuit that’s doubly-brushed with eggwash but you can omit the egg wash and have a pale shortbread if you prefer. 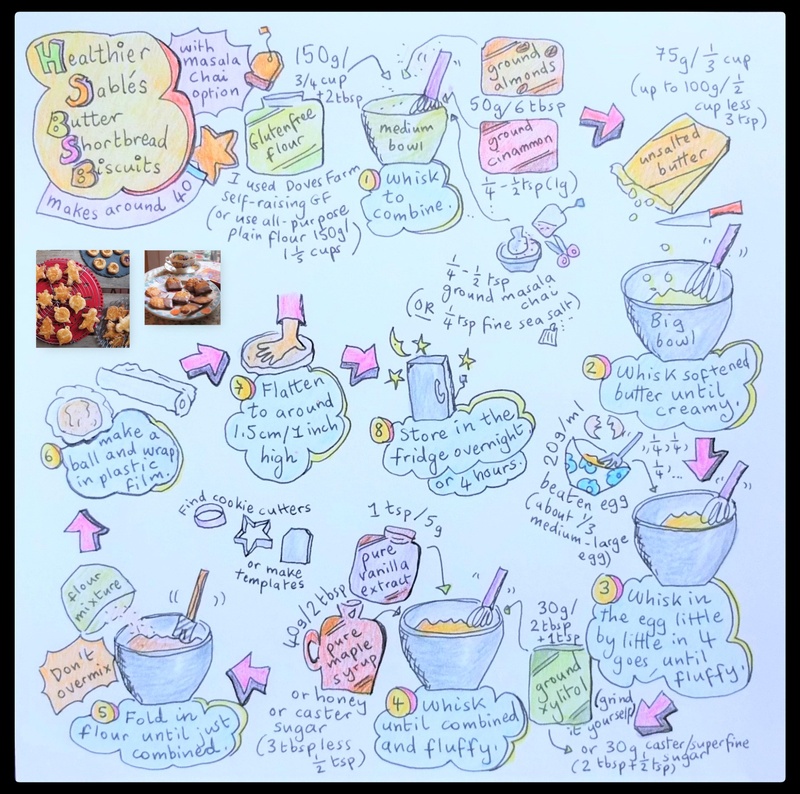 You could also folllow your own favourite shortbread recipe instead or use Christmas spices to make Christmas tea biscuits! 1/4 tsp ground masala chai (extracted from a tea bag), to taste (or 1/4 tsp fine sea salt for typical Alsace Christmas cookies. Alternatively 1/4 tsp Christmas spices). Note: I found masala chai and salt seem to clash so use one or the other. 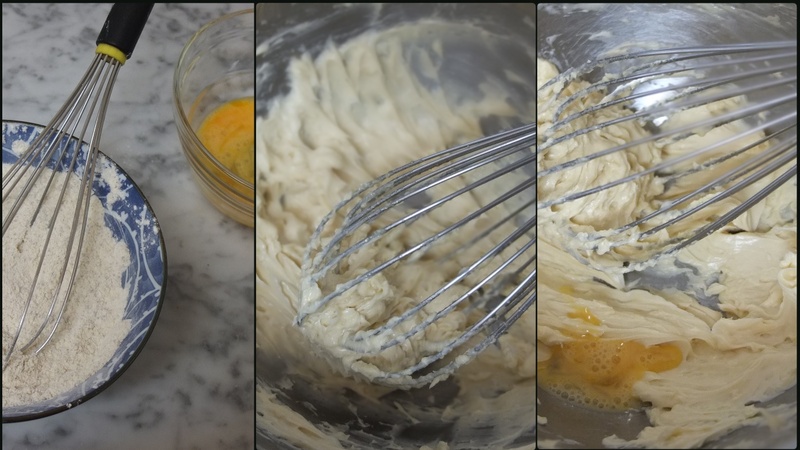 egg wash: 50g beaten egg (1 small-medium egg) + 1 tsp (5g) cream or milk + small pinch of salt – whisk together then strain through a sieve (Alternative: use only beaten egg for a lighter but less even glaze, as for my Christmas cookies). the dark or milk chocolate (probably about 400g/14oz), melted and tempered if possible (dark tempers and solidifies more easily). Check here for information in my basics section on tempering chocolate using the ice-water method or tempering chocolate – spreading method. Temper to store out of the fridge at room temperature where they’ll keep a shiny and stable chocolate coating. 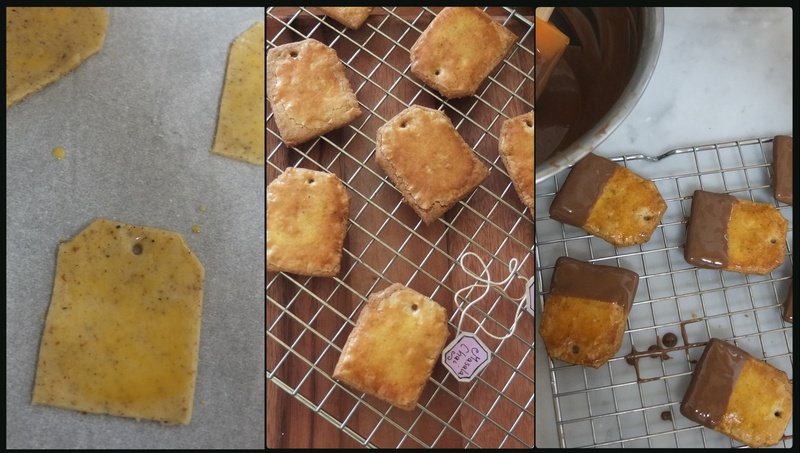 Or as a lot of online bakers do simply melt the chocolate but place the biscuits in the fridge to harden (spread out so they don’t touch each other) and store or eat them quickly! Eat as soon as you like! Pfeiffer says his shortbread biscuits can be stored up to a month in an airtight tin – mine are in sealed glass jars. If they’re in the fridge you’d probably want to eat them within a few days. Well been down with a rough flu since last weekend so feeling a bit sorry for myself … snif snif! But now getting better… 🙂 Haven’t been able to make it to work but it’s national holidays now. Yeeha! Kind of missing the little kids I teach who make me laugh – we do enjoy our songs, games and colouring. Instead I’m here on the sofa eating soups, reading, watching Netflix and starting to plan more baking projects! Yay! And it’s nice to have this online connection to the outside world and you guys! Again, yay!! 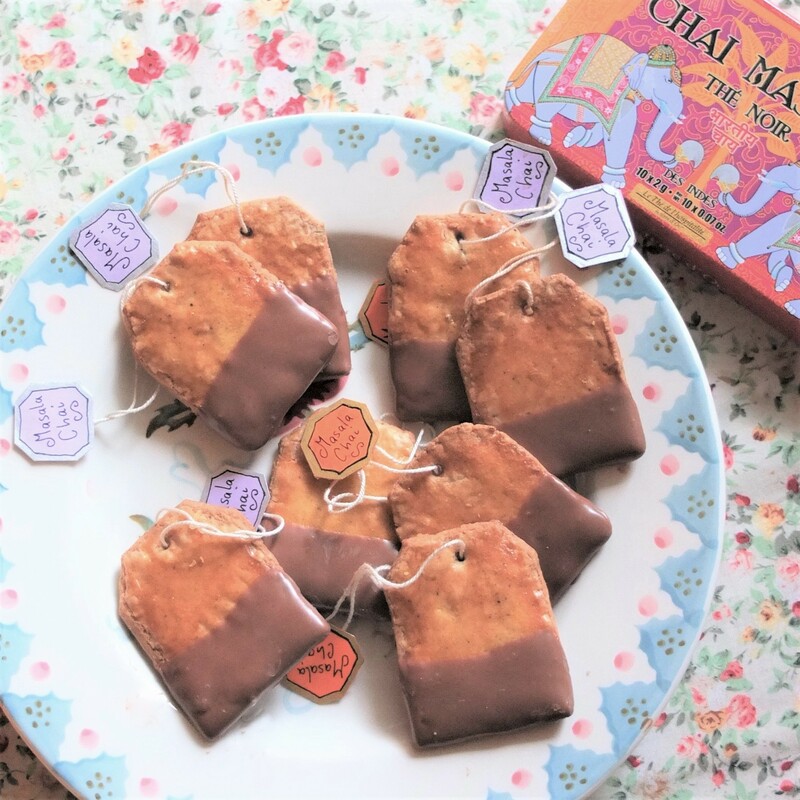 Have a masala chai tea bag biscuit! I LOVE THESE!!! They’re so cute! Wow, Lili! You always create very original recipes, not only in flavour but also in presentation. 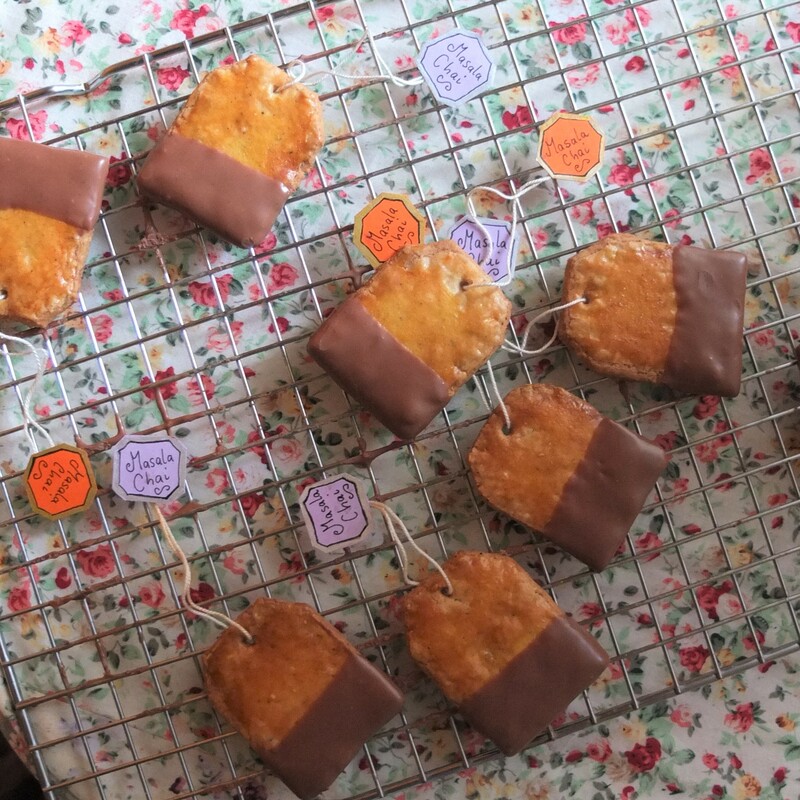 You surpass your creativity with tea bag form biscuits and decorating labels included! I imaging myself soaking the “tea bags” (with the help of the labels) in cappuccino, enough to make the chocolate soft, and savor it…mmmm Have a great day!